The group went down to Pease Park today. 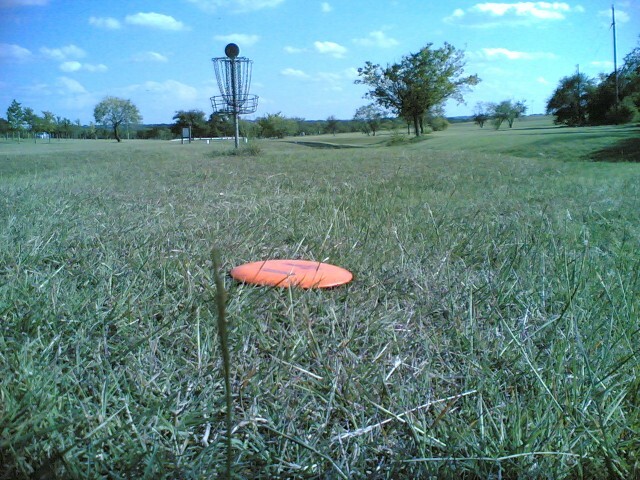 I can see why they want to close Pease down for disc golfers. There is no grass anywhere! The millions of people that have walked around here have destroyed all of the ground cover. And with all of the trees, the slow growing grass does not have a chance get grow back. This is the first time that our group has played singles. Curt suggested it and noone disagreed. Oh, and Curt brought his dog, Mingus, with him as well. 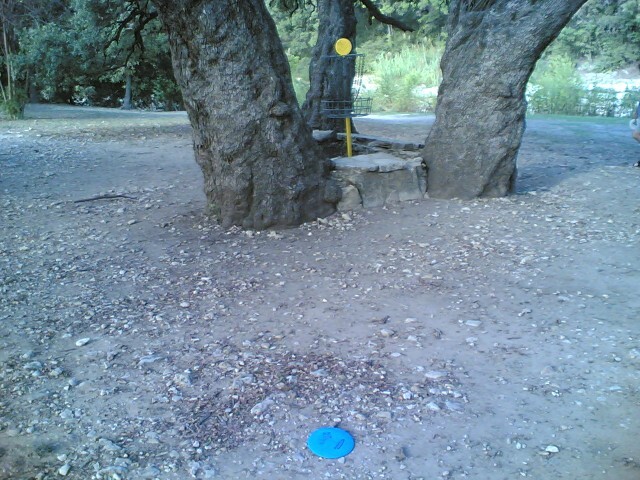 Rehana lost her disc up in the tree in hole 2. We called out for our super-hero to save us. Unfortunately, no one responded! I wonder where the masked man went to? 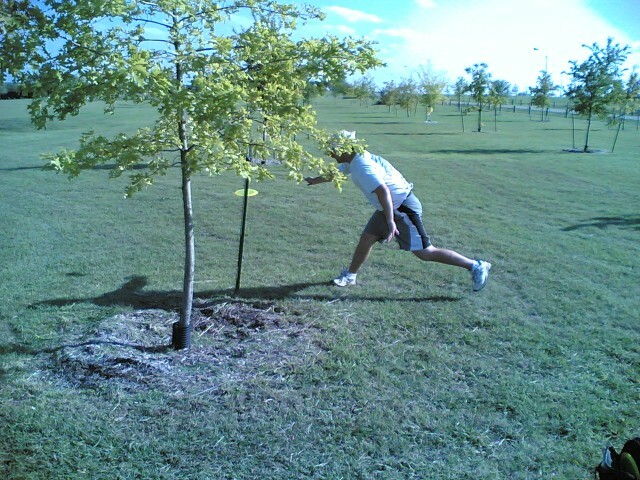 “Stick Man” Adam was forced to rip off a branch from a poor unsuspecting tree and knock the disc down. And on this hole, we had our first animal hit and run. John threw his disc, the disc hit the ground, skipped up, and hit a dog. Who then whimpered very loudly and ran to its owner. It was inevitable I guess. Too many people walking their dogs around here. My best shot was within range of hole 3. 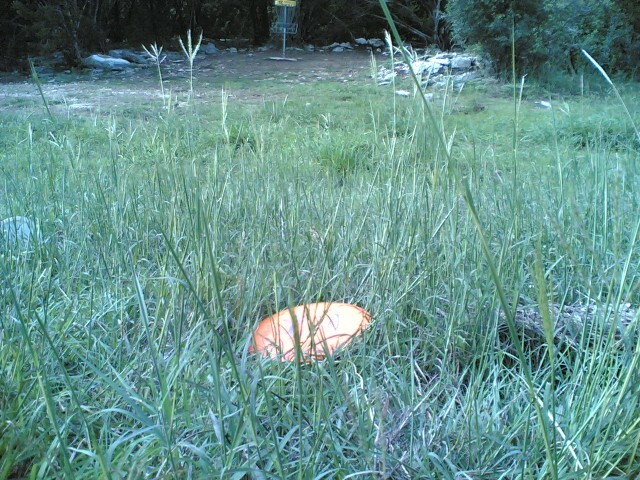 A birdieable putt for sure… but, sadly, I missed…. 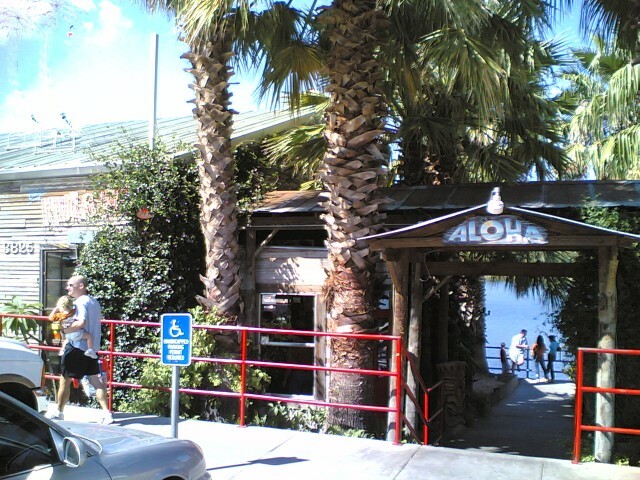 We went to Hula Hut for lunch afterwards. Good food, but still lacking in spinach. John brought out a deck of cards while we were waiting and we played one hand of mini-bridge. I had the most points (in AKQJ cards) so I was the declarer. Rehana put her cards down and showed me KJ09 and some other diamond cards. I had the Ace and Queen so of course diamonds were trump. Mini-Bridge is interesting and all, but I don’t think it will replace Tichu in its greatness. 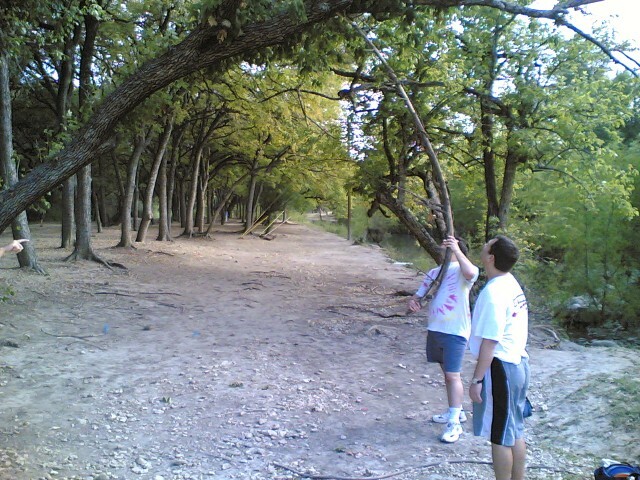 This entry was posted in Disc Golf on September 30, 2006 by Mark. 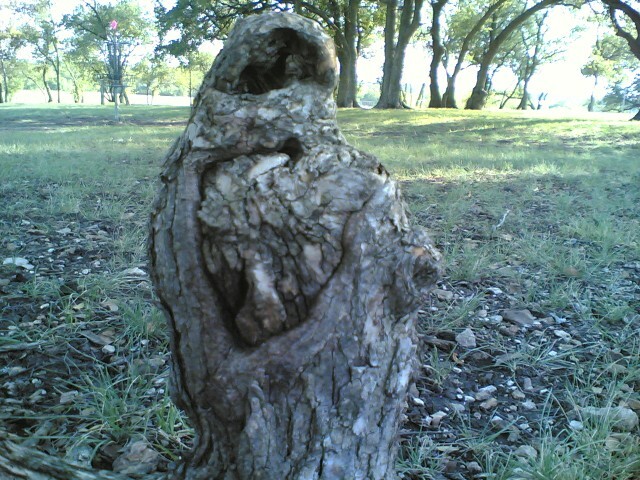 There is this tree at hole 14 that is birthing a baby Lorax. I wonder how long the gestation period is? Unfortunately, plants only seem to think about giving birth to more plants. And my body is getting more sensitive to pollen. Welcome to the allergy capitol of the world. 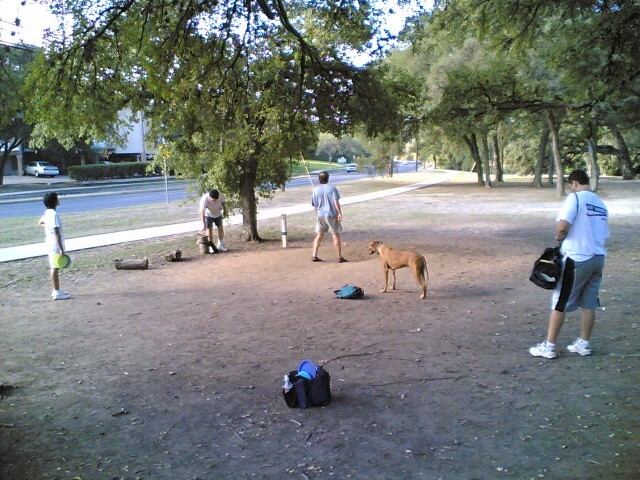 This entry was posted in Disc Golf on September 29, 2006 by Mark. 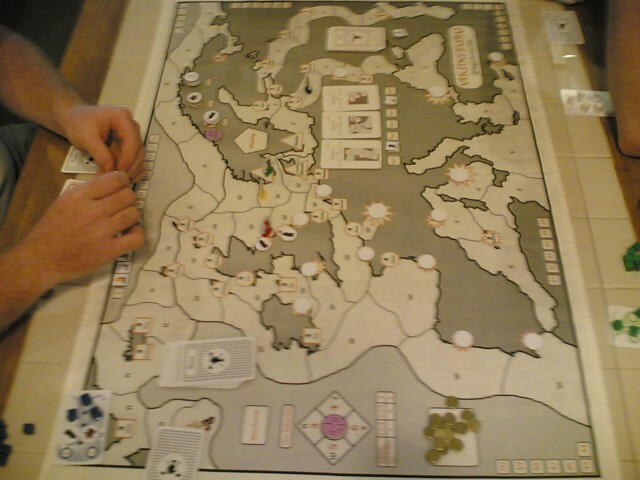 It has been a while since I have played this classic game from Knizia. Marty likes it as well, so it was easy to bring it to the table. For this game, I decided to concentrate on elephants. I picked and chose my battles, concentrating on gems. I also skipped a lot of battles and, as a result, had a large hand. There were enough cards for my final two battles and for a large bonus at the end. This was enough to give me the win. This entry was posted in Gaming on September 28, 2006 by Mark. This was a slow game of Tichu. Very see-saw like. First the opponents score most of the points. And then the heroes scored most of the points. 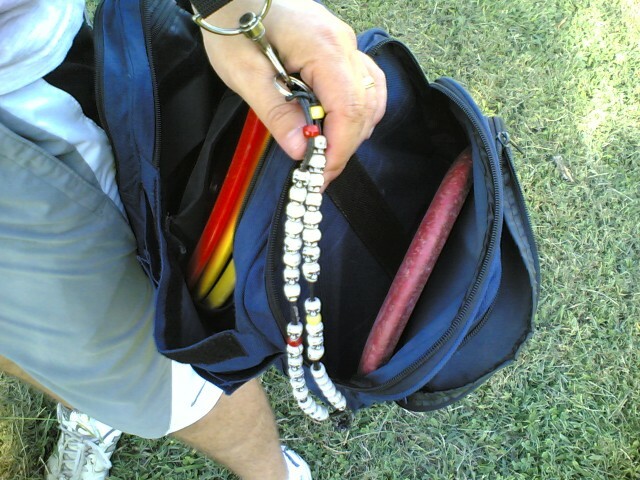 After 8 hands, the score was tied at 350 to 350. On one hand, I had an Ace bomb, no Dragon or Phoenix, and a number of single cards — such a waste of Aces. 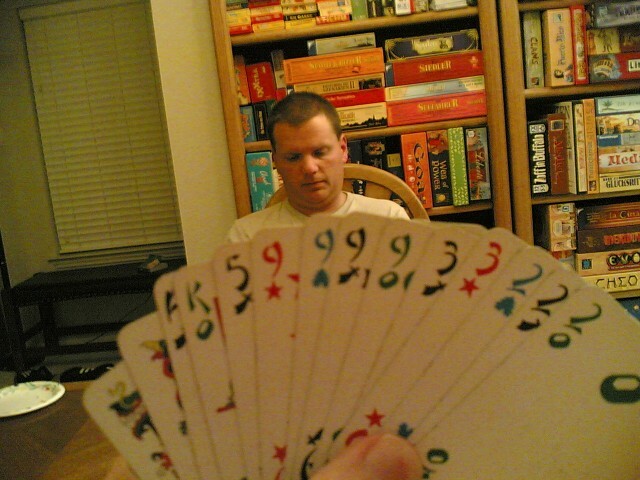 And then I had a Tichu hand. But I made a mistake. I was left with QQ2Phoenix and I lead the pair of Queens instead of trip-Queens. For the next hand, I was slightly on tilt. I called Tichu again. Fortunately, Adam had a Phoenix and an Ace to help me out. Next up to the plate, was Ed. He called Tichu and led an eight card straight. Adam over Tichued and played a higher length eight straight. He then played the Dragon and Jacks-full over Kings. Ed took that full house with Aces-full over Kings just to show that he really did have a Tichu hand. This entry was posted in Lunch Time Tichuers on September 26, 2006 by Mark. 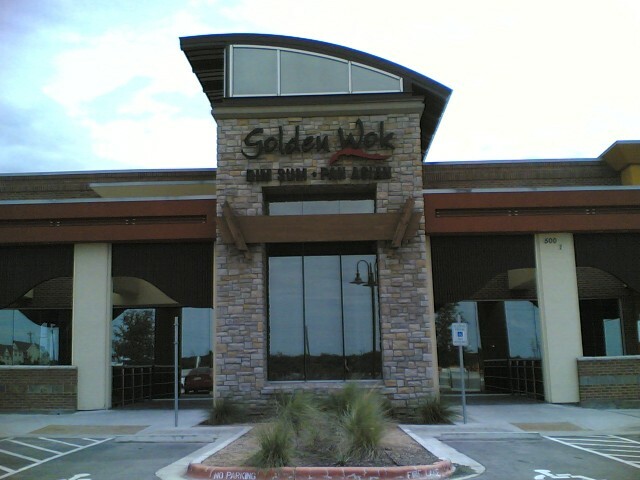 Went to the Golden Wok today for Dim Sum. Their Dim Sum is satisfying enough. Nothing spectacular and certinally not as good as Marco Polo. But the problem with Marco Polo is the distance. Golden Wok is 12 miles away from me whereas Marco Polo is 24 miles away. Twice as far, 12 minutes longer, and 1 more gallon of fuel spent. And then you have to spend it again to get back home. The difference between the food is not that much better. This entry was posted in Interesting on September 24, 2006 by Mark. 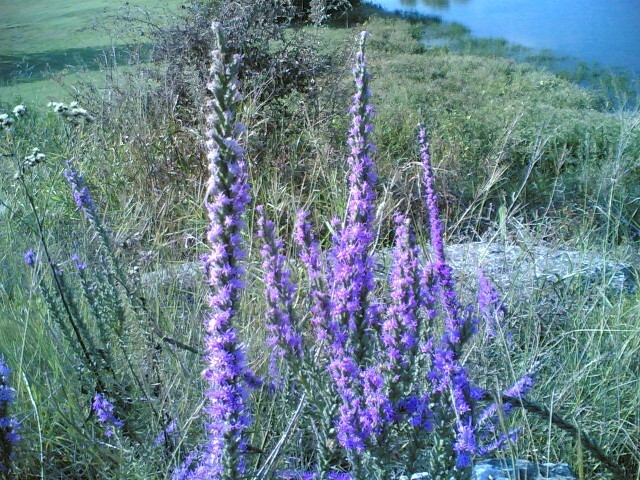 This entry was posted in Web links on September 23, 2006 by Links. Tim had a game day to both celebrate his birthday and to sell of some of his large collection of games. So the group went to eat lunch at Extreme Pizza after disc golf. Afterwards, we stopped here for some gaming. I brought out Viking Fury to the table. The Ragnar Brothers started out by producing games on tea towels. And this is one of them. On the plus side, the game is about Vikings, so there is possibilities for some role playing. But the negatives of this game really dampen my enthusium of it. There are quests that you perform that provide a sense of history of the Viking people. But it is hard to complete them yourself in one turn. If you do not finish a scenario, it is really easy for other people to just swoop in and steal that card from your grasp. It kind of unmotivates you to try and perform one of the requirements for those cards. Since it makes it easier for someone else to finish. Still, I am glad I played it. I would place this game into the once-a-year category of games. This entry was posted in Gaming on September 23, 2006 by Mark. 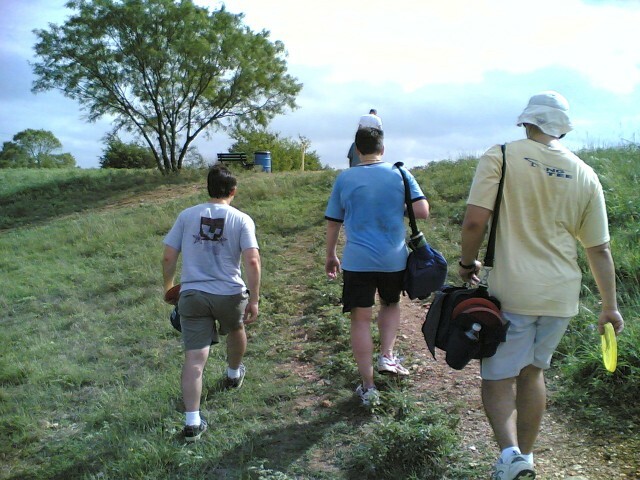 The group went out to Cat Hollow to play disc golf today. Nick brought out his brother-in-law, Eric. John and myself were on one team. And we were playing pretty good today. 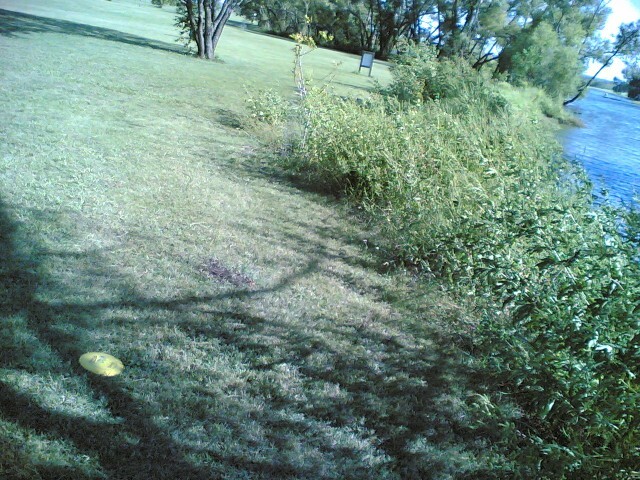 This entry was posted in Disc Golf on September 23, 2006 by Mark. 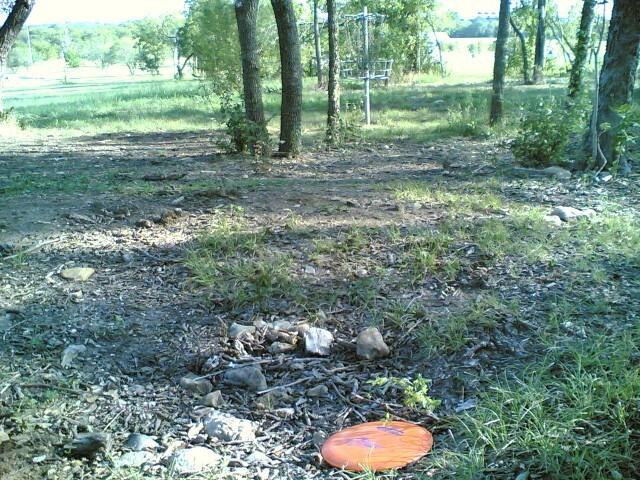 This entry was posted in Disc Golf on September 22, 2006 by Mark. We continued the old game theme by bringing out El Grande to the table. Another game that has sadly been ignored by the Cult of the Newists. It seems like that was one of the first area control games that I have been introduced to way back when. But, perhaps my nostalgia is affecting my memories. And it hasn’t lost anything from its old age, either. There is still a lot of tough choices that you are forced to make in the battle for royal favor. But we cannot forget Tichu either. Mike was willing to play once again so Jon and myself took advantage of the opportunity. The heroic team jumped out to an early lead. But we learned to not count the opposing team out. They were able to claw their way back into the lead and race to the finish for the win. The luck just left us and we were unable to score any points to get us the win. Above is one of my two Tichu hands. And here is what happened: I was able to play my 5, King, and Ace. I then lead my loosing full house. Jon plays over it with Jacks-full. I bomb with my 9s. Jon responds with an over-bomb of 10s. Mike over-bombs again to wrest control away from Jon. Mike had passed me the Phoenix and I was left with two cards (the other being the Dragon). Mike had two choices to lead next and he correctly chose the single card. John then wakes up and over Tichus me! I play the Dragon and then Phoenix to go out first. The Gorillas, Feel Good Inc. This entry was posted in Gaming on September 21, 2006 by Mark.